Harry N. Abrams, 9781419720000, 336pp. Jennifer Mason-Black has published short stories in The Sun, Strange Horizons, Fireside Fiction, and Daily Science Fiction, among other publications. Devil and the Bluebird is her debut novel. She lives in Massachusetts. jennifermasonblack.com. "A magical-realist adventure laced with folk guitar and outcast drifters unpacks the bonds of family—those we are born into and those we choose." "First-time novelist Mason-Black delivers a subtle, delicate tale reminiscent of the work of Charles de Lint, a magical realist journey of self-discovery and hidden depths, with fascinating characters and a captivating narrative." 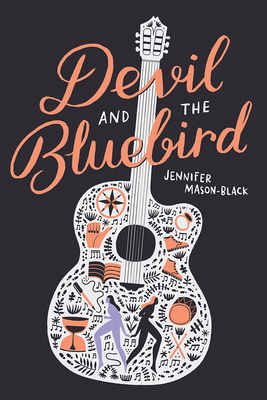 "In Devil and the Bluebird, the universal question of a soul's worth feels uniquely American, drawing on the folk legend of the devil and Robert Johnson. Mason-Black's story lives on society's fringes, tangling around small-time musicians, lost souls and street kids, highlighting the beauty and brutality of wandering the world alone. Older teens will especially appreciate this allegory for finding one's voice, finding one's own kind of family, and the danger of playing "a tune that's not your own."" “An eclectic mash-up of contemporary fiction and fantasy…Teens will enjoy this work for its colorful and memorable cast of transient characters. Fans of Andrea Seigel and Brent Bradshaw’s Everybody Knows Your Name and David Arnold’s Mosquitoland will enjoy this debut." "This debut novel is a beautiful and lyrical story of discovering your own voice. After each of her encounters, Blue gains understanding of the wider world and comes to learn and accept her responsibilities in both the wide world and her own smaller world. As Blue owns her own power, she understands that some things are not taken from us; we give them away. While this is a standard message in books for teenagers, this treatment is readable, engaging, and engrossing. The glow of Blue’s success lingers. Give this to readers interested in the music industry and music in general." "Old-school Weetzie Bat fans will be enthralled with this musical, meandering book brimming with magical realism and all sorts of ways to find and give love." "Debut author Jennifer Mason-Black's prose is fittingly lyrical, and her narrative always takes the most devilish of turns." "Expressive prose draws the reader into an overall enjoyable YA novel."